The former Minister of Local Government and Regional Development of Norway, Erna Solberg*, used untraditional methods to reduce the pressure of unwanted immigration and to stop refugees from coming to Norway. 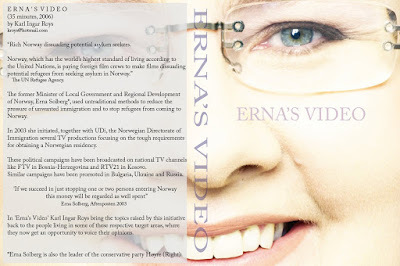 In 2003 she initiated, together with the Norwegian Directorate of Immigration and national network stations in the Balkans, several TV productions about the tough requirements for obtaining Norwegian residency, and caution that it’s no easy task to enter Norway, legally or illegally. The selection of suitable TV channels and journalists for these documentaries was made by the Norwegian Embassies in Belgrade and Sarajevo who also paid for these productions. These Norwegian anti-commercials has been broad casted on national TV channels like FTV in Bosnia-Herzegovina and on RTV21 in Kosovo (UDI also run similar anti-emigration campaigns in Bulgaria, Ukraine, Russia and Somalia). In Kosovo a more tough strategy was used. From an original one-hour documentary, a 30 second spot was edited out and broadcasted together with conventional commercials every day for 1 month at RTV21. The expenses in relation to Solberg’s and UDI’s anti-commercials were worth every penny following Erna Solberg’s statement in an interview with the Norwegian daily newspaper Aftenposten.